Caution: This is the second book of the Red Rising trilogy and contains spoilers for Red Rising. If you haven't read the first book my review is here! The first book had Darrow, a Red, become Gold and go to the school for Golds where he beat everyone, made friends and enemies and in the end got accepted into the house of the man who killed his wife. All in the name of revolution. In this book, there's a bit of a time jump- which was very confusing for me, and we're in the Gold version of university (at least in my opinion) but things are about to get ugly and for the first time in the trilogy we see action that isn't just play acting. I have a couple of points to make about the book; Firstly, in the beginning it was very confusing to get into, and I said this about the first book but I expected the second book to be easier since I knew the world and the characters. It wasn't and I struggled. It took me a long time to get into this book and I admit that until the last 200 pages, I was debating if I really wanted to be reading it. Not because it's a bad book, just that I wasn't involved in the story. This changed when I started reading at midnight and replied to a text, what seemed like twenty minutes later, that was actually two hours later. I literally lost time in this book. And it was wonderful. This book has all the excitement of the first book in a higher stakes environment. Rather than playing war, we see an actual war and the methods that Darrow has to really bring down the Gold hierarchy. 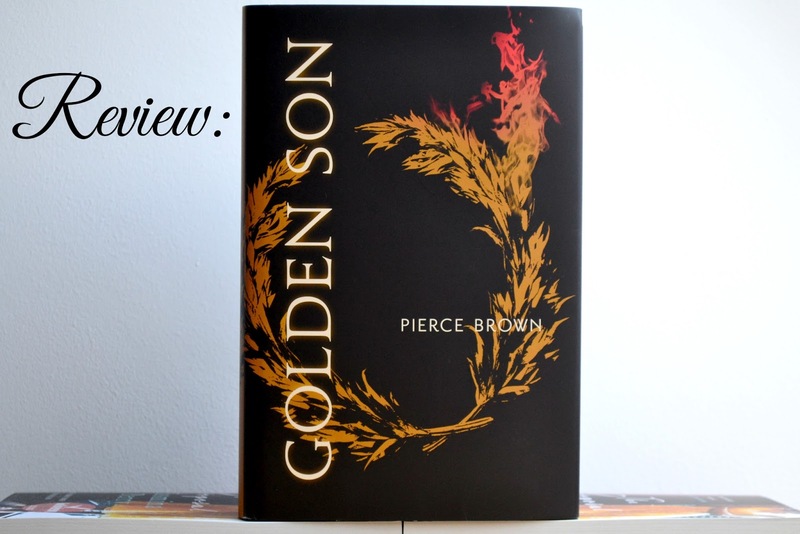 There's a lot of violence and gore too, Pierce Brown doesn't shy away from anything in his writing which can be quite unnerving when it's 2am and dark apart from the lamp on your bedside table. And oh, the cliffhanger. Oh. The second I finished this book I tweeted something along the lines of that I was so angry that I wanted to throw up. And to me, that's a very specific type of anger. That's not punching someone in the face anger, it's pretty useless to throw up from anger- I didn't but for some reason I wanted to? Chyeah, prepare yourself for this book. All in all, I'm pretty excited about the third and final book, Morning Star which is set to release in Spring 2016. Until then I'll just... wait and stew about the way this might end up. Want to buy Golden Son? You can get it here! Have you read any of the Red Rising Trilogy? What are your thoughts? *I was sent a copy of Golden Son for review, this hasn't changed my opinion.